Compact and super efficient, eWater Standalone Systems are economical to buy and easy to install. This wall-mounted, single-outlet unit can be easily installed into new sites or retro-fitted into existing sites. Standalone Systems produce cleaning and sanitising solution with safe, sustainable and effective water electrolysis technology. Ideally suited for kitchens, cleaning closets and other operational environments where a quick and easy on-demand production system will fit into workflow. "...a much safer environment for staff"
Lynden Aged Care is an 80 bed community-based residential aged care facility located in Camberwell. Ann Turnbull, CEO of Lynden, has emphasised the importance on protecting the residents from chemical exposure in addition to establishing an environment with a heavily reduced carbon imprint. Lynden Aged Care currently has an eWater Standalone System installed in the facility. Matt Stone, Executive Chef at Oakridge Estate and previously at Greenhouse Restaurant uses eWater solution to support a no toxic chemical environment within the kitchen. Matt Stone who was awarded the Gourmet Traveller’s prestigious Best New Talent Award in 2011 has been a vocal advocate of sustainable dining and has continued this philosophy at the restaurant at Oakridge Winery. eWater Reticulated Systems are ideal for any kitchen that has multiple sinks and hand wash basins and for large-scale operations such as food production facilities, fish wholesalers, processing kitchens, restaurants and production kitchens of all sizes. With central tanks supplying a network of taps and wash stations, eWater Reticulated Systems are custom-designed to meet the individual needs of the most challenging environments. "I didn't think it could possibly work..."
The recent rebuild of the iconic Stokehouse in St Kilda is the first 5 star Greenstar restaurant in Australia. A reticulated eWater Hygiene System has been installed to complete the package of green technologies. Owner Frank van Haandel said that "I'm really excited that the Chefs love it...they have told me that it's better than what they could have ever anticipated", and Group Kitchen Manager Ben Pigott remarked that "it actually works better than regular chemicals... based on that alone I would recommend it". Neil Perry's passion and enthusiasm for food, especially the importance he places on quality produce and sustainability is palpable in the projects he undertakes. His Italian ristorante, Rosetta, is no exception. In 2016, Rosetta was awarded Two Hats in the prestigious Age Good Food Guide. 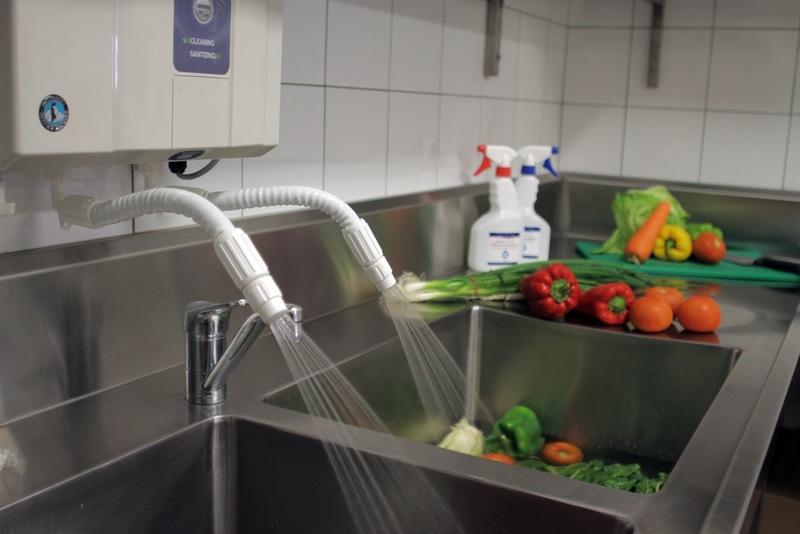 An eWater System reticulated throughout the kitchen produces cleaning and sanitising solutions that are used to eradicate bacteria on the vegetables, in addition to the benches and cooking equipment. Rosetta is the fifth collaboration between the Rockpool Group establishments and eWater Systems. We also carry a selected range of high quality consumable items specifically for use with our eWater Systems including specially graded eWater electrolyser salt, eWater cleaning and eWater sanitising spray bottles, eWater test strips, and eWater microfibre cloths as well as other parts and accessories.